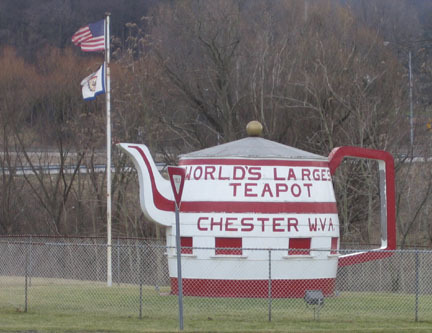 As promised, the world's biggest teapot. How did I come upon this awesome(?) site/sight? I drove up to Chester, the tippy top of WV, on Thursday for my Gov Summit on Aging steering committee meeting. We stayed overnight and met in the morning, as well. The route I chose took me past this thing. I remembered it was there, so I had my eyes open for it and had my camera ready, pulled off at a quickmart, snap. The Mountaineer gaming resort and racetrack was pretty posh, very large nice room, excellent food. But the constant electronic noises of the machines was a bit much for me. I wonder what pitch that was? There was definitely one main pitch humming predominantly. Hate the criminal justice system in the US? This is your brain on jail. So check out my new computer station. I'd been wanting something different for a long time, but couldn't decide. I thought about a computer armoire, but those things take up a lot of space in a weird way. Who wants to put things on closed shelved that are 18 inches deep? 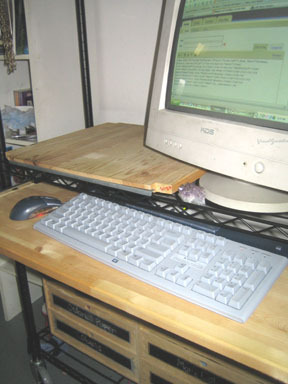 I wanted something mobile enough to easily sweep behind, and a big huge wide keyboard shelf, since the one I've been using is only keyboard wide, no room for mousey. 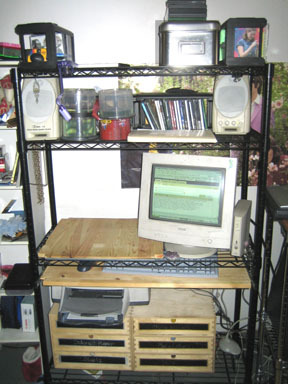 I really like wire shelving, especially flat black or shiney chrome. I found this one at Lowes on sale, and it's on casters. They didn't have this size in Motown, but their computer said it was in C'burg, and I shoot right past their on my interminable and frequent trips to Chastn. 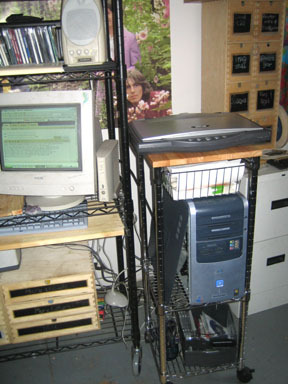 But it of course is not designed as a computer desk, and has no keyboard shelf or moving shelves at all. I have installed sliding shelves in my pantry, so I figured I could just do that on this new rig. Easier said than done. Two immediate problems, wire shelving doesn't give you as much wiggle room on where fasteners go, and nothing to screw into. Conundrum. I found a couple of nice pine panels around the house, one needed only about an inch cut off to fit the width of the shelves, and was already about the right depth. Cool. 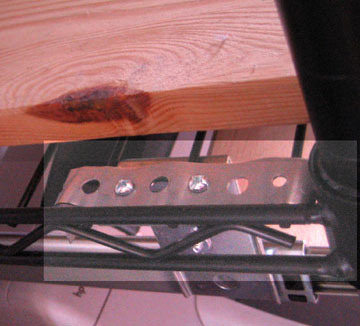 Now how to fasten shelf-sliders onto the wire shelves or hollow metal posts. Probably could have been done more elegantly, but my solution is certainly working great. I cut some steel plumber's strapping to size, bent the ends over the wire on the shelf above, and bolted the shelf-sliders below them sandwiching the wire. Trickier than it seems, because though the height of the sliders is adjustable, the placement of where the fittings are horizontally on the slider is not.